Jabra rolls out its new wireless headset Jabra Evolve 75 for office workers. This latest headset sports a superior Active Noise Cancellation (ANC) and an integrated ‘do not disturb’ busy light. These along with a couple of a unique combination of features make this best wireless headset for maintaining concentration in the office. The very successful Jabra Evolve Series has sold over 2.5 million units around the globe. This latest headset is an addition to the same series. This series was technically designed for the people working in the office. You can be assured of having a distraction-free and focused open office working environment. The very new Jabra Evolve 75 takes this one step ahead by coming up with combined strongest parts such as great sound, ANC, busy light and most of all wireless freedom. Not only this, the Jabra Evolve 75 also has world-class speakers for HD voice and music which provides crystal clear calls. It has a wireless range of 10 meters (33 feet) for Smartphones and 30 meters (100 feet) for Laptops. The headset also has dual Bluetooth support for calls and music that allows the user to pair this with two connected devices simultaneously. This device has been certified for modern office use as it meets Open Office and Outdoor requirements for Skype for Business from Microsoft. It is certified for Skype for Business, Cisco, and other leading Unified Communications (UC) platforms. 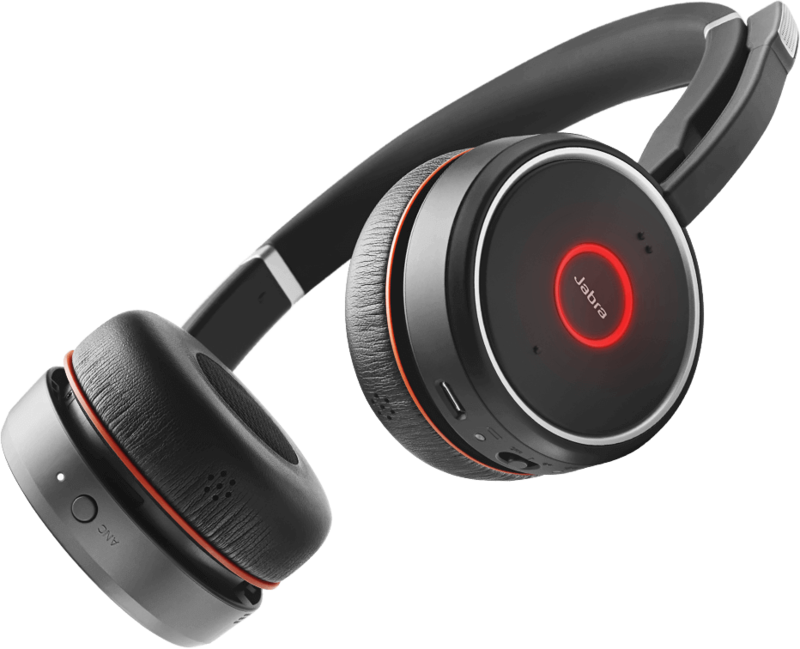 The Jabra Evolve 75 has compatibility with Jabra Direct which is free cloud-based software and can be used to manage and personalize the headset. It boasts of a battery backup of 15 hours. It features an optional charging stand which helps in easy charging. The docking also sports an optional charging stand which eventually eliminates your battery concerns. It has an all-day comfort leather feel ear cushions and a discreet boom-arm which can be clipped into the headband when we are not on the calls. We already know by now, that this headset is designed to offer freedom and flexibility of movement eliminating the noise and interruptions. But, if you want to hear some important announcements, there’s an easy to reach button on ear cups without removing the headset. In an office environment, there are plenty of people working together who break your concentration and hamper the productivity. So, noise blockage is very important in a modern open office environment for staying focused. According to a recent research from Jabra, we found that employees tend to lose almost 24 minutes every day because of noise and interruptions. Also, 78 percent believe that their productivity is impacted negatively. Overall, the Jabra Evolve 75 is the ultimate business tool for sound and freedom which helps in maintaining the collaboration, concentration and productivity in a busy open office and you don’t need any designated quiet rooms anymore to stay focused on the task at hand. The Jabra Evolve 75 is priced at 279 USD and you can expect this product in India around July 2017.